vorpX is a 3D-driver for DirectX9-11 games that is specifically geared towards VR-devices like the Oculus Rift. Additionally to ‘making games 3D’ it offers various features to tackle many of the issues that arise when playing games on the Rift that are not designed for it. vorpX currently is the only available solution that allows you to experience modern DX10/DX11 games like Bioshock: Infinite, various Call of Duty titles, Battlefield 3/4 and many others on your Oculus Rift. vorpX is a 3D-driver for DirectX9-11 games that is specifically geared towards VR-devices like the Oculus Rift. Additionally to ‘making games 3D’ it offers various features to tackle many of the issues that arise when playing games on the Rift that are not designed for it. vorpX currently is the only available solution that allows you to experience modern DX10/DX11 games like Bioshock: Infinite, various Call of Duty titles, Battlefield 3/4 and many others on your Oculus Rift. vorpX supports about 80 games officially in Stereo 3D, but many more DX9-DX11 titles will just work out of the box. The only thing missing in these unsupported games is Stereo 3D. Everything else works, including full headtracking. The list of officially supported games can be found here. 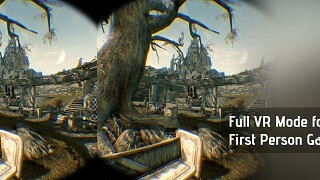 Depending on your personal preferences and/or specific games you can switch on-the-fly between a super fast 3D method, that ensures 60fps in almost any game, which is very important for a good VR experience, and a ‘classic’ 3D mode that renders two views (not available for all games at the moment) . vorpX is built from the ground up to use multi-threading, which – among other advantages – ensures that no extra input latency is introduced for head tracking. High framerates and low latency are the key to a enjoyable VR experience. EdgePeek and/or ImageZoom allow you to easily look at screen elements that are otherwise hidden in the Rift, like maps, health indicators etc. 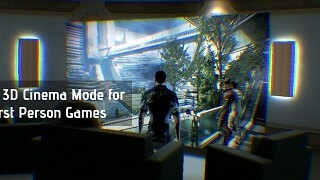 This also allows you to look around while cutscenes are played as if you were looking at a screen in front of you, effectively minimizing nausea induced by fixed camera cutscenes. Pressing buttons on a keyboard is a bit hard while being immersed in a virtual world. vorpX allows you to map up to 16 keyboard shortcuts to a special VR-Menu that works by just looking at a ‘button’. Think of it as a kind of augmented reality interface inside the game. Playing games on the Rift is more fun using a gamepad. vorpX’s fully configurable gamepad emulation allows you to play any game with your X-Box 360 controller, even if it does not have gamepad support. This also solves issues in games like Skyrim or Fallout 3 that do not allow you to have gamepad input and headtracking otherwise. Many titles (mostly racing games) do not have mouselook. 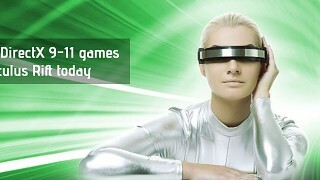 vorpX takes care of that and enables headtracking in many of these titles. vorpX’s camera roll works like your body does, using an anatomical ‘head and neck’ model. This allows natural head movement and thus helps avoiding nausea and other unpleasent side effects. For the most realistic experience on an HMD like the Rift games should use a higher field of view compared to playing on a monitor. 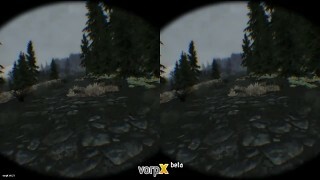 vorpX allows you to enhance the perceived FOV for games that do not have an option to alter it. In Geometry 3D this is done by widening the viewing angle of the camera, but there is also a 2D FOV enhancement that works with any game. vorpX’s warping shader has several optional image enhancement functions, like chromatic aberration correction and supersampling. To not waste a single pixel of the rendered image, the display area can be easily adjusted according to your individual eyesight.